After talking about the general worldmap generation in our last blogpost, this week we’re going to take a look at some of the changes and additions coming to the village screens. The rework of the village screens is twofold: We’re doing both a complete visual rework and adding lots of new features. Let’s go into some details! A key design goal for our new worldmap is to have every corner feel unique and make for a less generic world overall. That’s why we’re adding more terrain types and unique landmarks (more about them later! ), and that’s also what we’re trying to achieve with all the settlements you can interact with in the world. Whereas previously all villages, cities, watchtowers and strongholds looked exactly the same, did the same, and were pretty much interchangeable, we want all the new settlements to be recognizable across the world for their individual look and very different services they offer. Settlements now have a clearer purpose and this is reflected both in gameplay and visuals. For example, a fishing village along the coast will offer you predominantly fish as provisions for relatively cheap prices, have more fishermen than other backgrounds to hire, and will have visuals that reflect its purpose. A mining village at the foot of mountains, on the other hand, will have a better selection of both metal-based equipment and potential recruits with the miner background. Another change relevant mostly to those of you that speak German is that settlements now always have a name that actually fits them. No longer will you find ‘Dunkelwald’ on open plains! 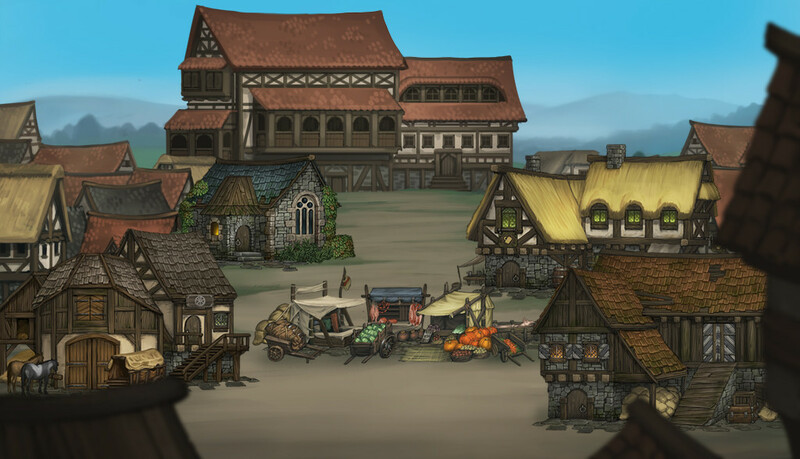 The all-new village screen shows a panorama of the whole settlement and not just a single street corner anymore. It’s made up of 15 different layers with a variety of different images to make each and every settlement appear unique. The background layers are determined by the surrounding terrain, with villages close to a forest or high up north in the snow looking accordingly. Atop a hill sits a townhall or fortification of different size based on the type and size of the settlement, and the hill is flanked with different houses or terrain depending on the settlement’s purpose. The most important part are a set of buildings placed along the incline. Those can be interacted with, and they offer all kinds of different services to the player. You’ll find a marketplace of some kind to buy general supplies at in almost every settlement. Larger cities may also have specialized traders that offer higher quality weapons or armor for higher prices. Taverns may allow you to give your men a good night’s rest in relative safety, and the docks of coastal villages and cities allow you to book passage on a ship to other settlements as a means of fast travel. This modular system of buildings allows us to easily add new buildings with new services as we progress in development. There’s a lot of things that come to mind – a money lender or a barber to customize the appearance of your Battle Brothers, for example. We’ve yet to see what buildings will make it into the game in the first round, and which buildings may be added later on. Note that the above images are still work in progress and do not represent the final quality. 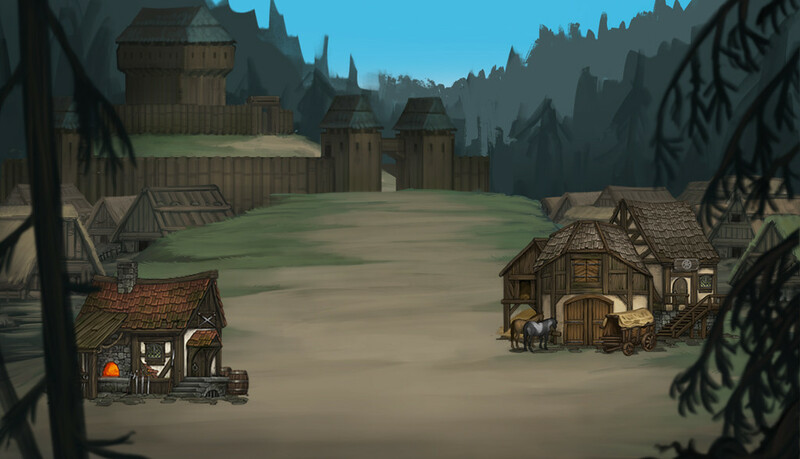 There are no people in the settlements yet, and we’ll do another pass to make all the buildings easily identifiable. The village screen currently in the game was always considered placeholder by us and the new village screen will feature artwork at a higher quality for what will ultimately be a nice coherent look across the whole game. 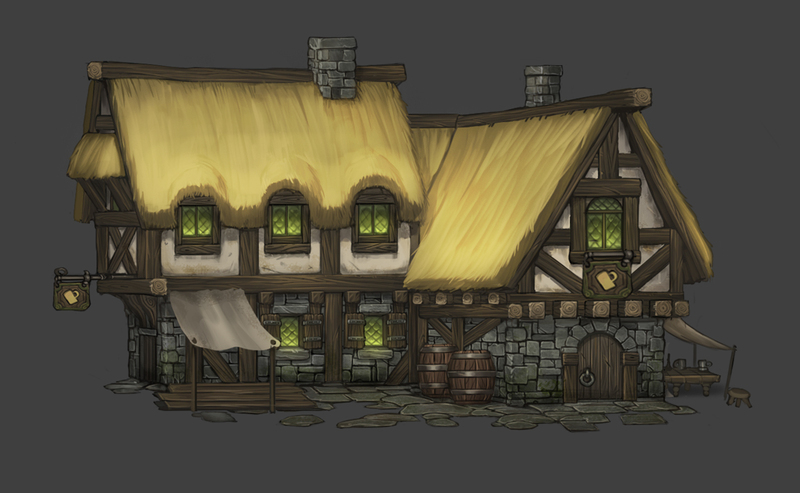 The image below shows a tavern at full size and should give you a good idea on how detailed everything will end up looking. MAJOR UPGRADE! Sweet! Looking forward to it… and I’m sure there’s more surprises to come along the way. Great Job Developers!!!!! This look really nice. Keep the good work guys. Very interesting ideas, indeed. It will help the places look and feel more unique. What I’d like to see at some point, is a way of recording the presence/area of control of enemy/friendly factions, and hopefully a way of meaningfully pushing back invading clans (in my games, orcs seem to expand rather aggressively, whereas the undead are much rarer -which is not bad, I’m just mentioning it because right now if feels like a losing/pointless battle -well, not quite “pointless”, I’ve spent hundreds of happy hours with Battle Brothers :)). Looking forward to this next major update. I know you dont want to deep and complex economic simulation game, but I do hope to see a very basic trade mechanic similar to Mount & Blade (but perhaps less complex). A system, where trading can be a viable strategy alongside completing quests etc. You have already laid the groundwork for this with the specialised villages you are introducing… some may perhaps produce stockpiles of ore, some wool, some fish, you dont even need a ton of different types of trade-able items, just enough to buy and sell at a profit. With the different regions and the larger world map this would be a cool way of making extra money (which could also perhaps benefit those towns and villages most in need). Ofcourse with great reward, comes significant risk… bandit parties will more frequently target battle brothers that carry trade goods. Plus upon retreat, all trade goods could be lost and left behind…. Noticing the variety in architectural design, too. The scene with the fort has buildings that look very distinct from the next. I like it. Very cool, I’m excited about certain backgrounds being focused and find-able in certain regions. I like the wildman background in particular, and I hope I can find an enclave of savages out in the woods for my future outfits. I’m also excited about the idea of inns, I recently got hit with the Sickness event that just decimates your combat ability so hopefully a couple of days getting drunk and relaxing in the tavern might help that. I’m in awe at the commitment you guys show. I’m so glad I opted for developers version. It’s already almost too much fun. Now all sorts of sweet details to look forward to. Can’t wait, and as RusBear says, “Don’t lose your enthusiasm”! A Weaponsmith sells weapons and can repair weapons while the armor smith offers the same for armors. The Ward or chapel or temple or however it will be called will offer healing for the wounded.